These Hello Kitty wallpapers are perfect for anyone who loves Hello Kitty. I've looked at hundreds of Hello Kitty wallpapers and these are my favorite - the best of the best. These top 25 free Hello Kitty wallpapers are spectacular, and all of them are completely free to download for your computer desktop. Visit each link to download the Hello Kitty wallpapers. The photos used here are just to give you a preview of what the Hello Kitty wallpapers look like - they're probably too small to actually use. You can learn how to change your computer wallpaper if you need help in getting these Hello Kitty wallpapers on your computer. Find more Hello Kitty wallpaper by searching the best free wallpaper sites. This Hello Kitty wallpaper is rather simple: Hello Kitty with her name written underneath, but it's one of my favorites. Click Enlarge Wallpaper underneath the Hello Kitty wallpaper to get it adjusted to the proper size for your computer screen, but you can then choose Options to get the original image as well as some other sizes for standard and widescreen monitors. Hello Kitty is all dressed up for a day of fun in this pretty in pink Hello Kitty wallpaper. You'll need to chose the Download Now! button next to the Hello Kitty wallpaper to download it. 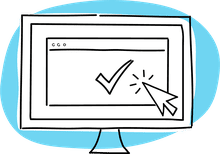 By default, your screen resolution will be detected but you can also download one for a different sized screen. This Hello Kitty wallpaper was released on her 30th birthday. You'll never grow tired of this classic Hello Kitty wallpaper. To download this particular Hello Kitty wallpaper, you can just right-click the image and choose to save it to your computer. Now this Hello Kitty wallpaper will show everyone just how much you love her. It's a sweet as can be Hello Kitty wallpaper that is outright adorable. 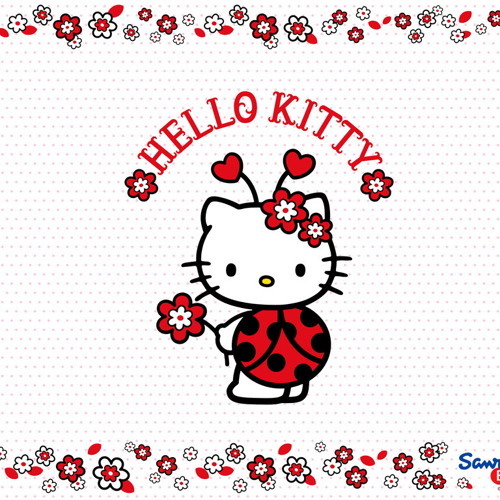 You might think that Hello Kitty is a cat but in this Hello Kitty wallpaper she's actually a ladybug! I just love the flowers that border the top and bottom of this Hello Kitty wallpaper — don't you? Hello Kitty has put on her toe shoes and she's already to show you her ballerina moves in this Hello Kitty wallpaper. It's very simple to add this Hello Kitty wallpaper to your desktop so you can enjoy it day after day. Doesn't Hello Kitty make an adorable nerd? This widescreen Hello Kitty wallpaper shows the brainier side of Hello Kitty who's all ready to hit the books. To download this particular wallpaper, right-click the photo and choose to save it to your computer. This is a unique Hello Kitty wallpaper where someone has turned out all the lights on our dear friend. This Hello Kitty wallpaper is definitely something that your friends will drool over when they see it on your computer desktop. You'll have sweet dreams when Hello Kitty wishes you a goodnight in this Hello Kitty wallpaper. The blue background makes Hello Kitty look like she's close enough to touch. Hello Kitty is all dressed up in her apron and is ready to go to a cooking party. Will you join her? This Hello Kitty wallpaper is available for regular sized computer monitors in 1027x775. This is a 3D Hello Kitty wallpaper that features Hello Kitty with all of her playmates. The white background of this Hello Kitty wallpaper means that your desktop will look nice and clean. Here's a very classic Hello Kitty wallpaper that is just simply adorable. After you visit the link be sure to click on the Hello Kitty wallpaper to get it to its biggest size. This is a great Hello Kitty wallpaper if you're looking for something a little bit different. Hello Kitty has a lemon in her hair set against a lime green background. Hello Kitty has dressed up like the prettiest peacock you've ever seen in this Hello Kitty wallpaper. I have to say, I don't think Hello Kitty's every looked this cute! Right-click the image through the link below to save it to your computer. This modern Hello Kitty wallpaper features Hello Kitty's profile and the words hello, hello kitty underneath. This Hello Kitty wallpaper is available in only one resolution at 1920x1200. This Hello Kitty wallpaper has a great vintage feel to it and features beautiful reds and browns. This is a normal sized Hello Kitty wallpaper and will work on almost any computer monitor. Two best Hello Kitty friends take a break in this Hello Kitty wallpaper. This would be the perfect Hello Kitty wallpaper for and your best friend to have on your computer screens. This classic image of Hello Kitty is made especially as a cell phone Hello Kitty wallpaper. From whatever device you're using, just save the wallpaper like you would any image. This is an HD Hello Kitty wallpaper with a dark pink color rising to white toward the top. It's a simple Hello Kitty wallpaper but I just love the pink background design on it. In this Hello Kitty wallpaper, Hello Kitty is enjoying the winter by ice skating on a frozen pond. There are more free winter wallpapers you can download if you love winter scenes on your computer desktop. This Hello Kitty wallpaper has our little friend all dressed up for Halloween. I bet she's hoping to get some apples when she's out trick-or-treating this year! You'll find more free Halloween wallpaper that's a little more on the scary side as well. Hello Kitty loves Christmas and it shows in this lovely Christmas Hello Kitty wallpaper. You can find other free Christmas wallpapers to help you celebrate the holiday in style. Here's another holiday computer wallpaper, this time a Valentine's Day wallpaper that features Hello Kitty. Hello Kitty wants to be your valentine in this sweet Hello Kitty wallpaper. See these free valentine wallpapers if you're looking for more. Hello Kitty is celebrating Thanksgiving as a pilgrim this year in this Thanksgiving Hello Kitty wallpaper. I have more free Thanksgiving wallpapers if you'd like to check them out. Hello Kitty is dressed up like the Easter bunny in this adorable Hello Kitty wallpaper. Just right-click the picture on the download page to save it to your computer. If you like this Hello Kitty wallpaper, then you're going to love my other free Easter wallpapers.